Weasel: Hey, did you hear that everyone, Chuck's hungry! Chuck: No, I'm not hungry. I'm....HUNGRRRY!!! 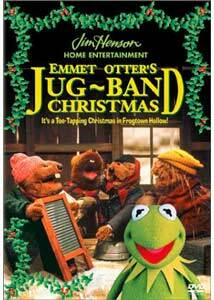 For years, the Jim Henson project Emmet Otter's Jugband Christmas has been afavorite amongst many families. It's something that generations have grown up on, thoughit still remains relatively underrated and obscure amongst Henson's work. When I fired upthe new DVD incarnation of one of my own childhood favorites, I was worried that perhapsage would destroy it and make it lose it's overall effect. I was astonished, however, whenI realized that, if anything, it's gotten even better with age. The Jim HensonCompany has brought so much to world of children's entertainment, from SesameStreet all the way up to Bear In The BigBlue House, and they have all carried the same standards for quality; mainly, nevertalking down to children, but treating them as intelligent beings, rather than zombifying by fast-moving advertisements for toys. Emmet Otter, whichoriginally debuted in 1977, is arguably one of the company's most lovingly detailed andastonishingly well written programs, based on a children's novel of the same title. It standsas a true, shining example of what "family" entertainment can really mean and where suchentertainment might want to head. Set in the world of Frogtown Hollow, Emmet Otter follows the story of youngEmmet, his mother, and his friends as they decide to risk family security in pursuit of theirdreams. Emmet and his mother live a decent life cleaning and delivering laundry to all theother forest animals, but yearn for something more. As winter sets in, Emmet gets astrong yearning to enter the local talent contest with his friends as a top-of-the-linejugband. The problem is, the only way to make one of the crucial instruments would befor Emmet to damage his mom's washtub, a precious thing to his poor family's livelihood. On the same token, Emmet's mom would like to sing in the contest as well, but in order to afford some good clothes, she'd have to hock Emmet's tool chest, which he uses for various odd jobs. If one of them won the contest, though, the money prize would be enough to let them live a bit better. The dilemma is obvious, but the talent show is too tempting for either of them to pass up. While the central story deals with this desire to enter the talent show, there is so much more. A great deal of time is spent elaborating on the relationship between Emmet and his mother, with some of the finest, wittiest dialogue I've ever heard in a kid's program. There's also a group of supporting characters, including Emmet's friends, that really add dimension to the little world of Frogtown Hollow that Henson and crew have created. Whether it's the snide and arrogant Gretchen Fox, or the gossipy and nosy Heddie Muskrat, those memorable Muppet characterizations really put you in the story. Not everything is well-handled drama, though, and there's a lot of humor thrown into the mix. A good portion of this humor comes from the inclusion of the "Riverbottom Nightmare Band", a heavy-metal group from the distant city who have come to Frogtown to win the talent show, and cause all sorts of mischief around town. Speaking of music, Emmet Otter has plenty, and though it's a biton the dated side, it's still a pretty solid score from composer/singer Paul Williamswith memorable tunes and some great incidental music. It's impossible to discuss Emmet Otter without mentioning the amazing artistryby which it is executed. While the trademark puppetry and marionette work is at theheart of the show, the attention to detail is simply staggering. Henson has literally createda "world" for these characters, from realistic trees and grass, to a boat ride with Emmetand Ma actually rowing with oars while ducks and birds moving about. Everycorner of the screen is filled with something that obviously took time to make seemconvincing and real. From the wonderful sky shades right down to the buttons onEmmet's winter jacket, it is a wonder to behold this level of micro-management at thedesign level; all done without blue screen, back-projection, or any other off-screen tricks. Sure you can see the strings at times, but who cares? I think it stands as one of Henson'sgreatest achievements. Image Transfer Review: Crisp and clear, Emmet Otter's Jugband Christmas looks great on DVD. Whilethe original videotape is a bit aged, there are no signs of compression artifacts or any otherdigitally-induced problems. The source also has no obvious problems and is amazinglyfree of nicks or speckles. All of the colors are bright and brilliant, just as rich as Iremember the original broadcasts. This is as pristine and lovely as a near 30-year-oldprogram can get. Audio Transfer Review: The new Dolby 5.1 sound mix is largely unimpressive and seems, frankly, pointless. Thevast majority of the film is collapsed into a single center-channel mix with some minorstereo enhancement during some of the music. Because of the clarity and single-channelnature of the mix, the source material sounds extremely harsh and tinny. The Dolby 2.0mix sounds much more natural and fluid and since the 5.1 doesn't add any impressiveambience or directionality, I'd recommend the 2.0 instead. There seems to be a bit morebass in the 2.0 version as well, adding some much needed low-end to balance out theobvious flat quality of the program. Extras Review: There are no extra features other than some trailers for other Columbia/Tri-Star homevideo releases. It does bear mentioning, though, that the particular version of EmmetOtter on this disc is the "edited' cut that has been making rounds on home video forawhile now. Slightly different from the original, this version has several unusual cutswhere bits of dialogue are removed or altered. I'm not sure why this was done, but for allthe cuts, the footage is replaced with other stuff. This may disappoint long-time viewers, Iknow I was certainly taken aback by some of the cuts, but overall, the show is no worsefor the wear and the additional footage makes up for it enough. I just wish there was anofficial explanation for why and where this newer cut came from. Emmet Otter is earnest fun. It is a bit dated, I must admit, but it's still a timelessclassic; a pure masterpiece of artists at the finest of their form, collaborating to createsomething charming and lighthearted, but with a definite sense of depth. It's innocentwithout being simple-minded and it manages to tackle serious emotions; all in only 50minutes.